Mines, shale gaz, oil. Natural resources remain a major news item even in our cloud economy. The rapid increase in the price of oil and metals, over the last decade, coupled with the development of new technologies allowing the exploitation of non-conventional resources, has led to major worldwide revival of interest for natural resources. Led, in large part by China, this new interest has followed the explosion in demand and the multiplication of mining project across the world. Managing mining resources (in French) draws the portrait of an industry with roots going back 10 000 years and that has defined the major eras of the human development. Even today, it remains a crucial element of the survival of our civilisation. In order to give the reader the tools to better understand the current situation, it goes back through history, describing the evolution of the industry, its techniques and its contributions to society. The book also presents the most recent developments, and explains the differences between the various metals and hydrocarbons when it comes to the to plan and exploit the resource. Beyond the access to the resource, it is essential to rethink mining exploitation as a sustainable industry. This is not so obvious as environmental, social and economic impacts are still at the center of importants mining conflits around the world. How should one proceed today, in an era where local populations are much more aware of the long-term impact of short term development. This books closes on a look towards the future: What will be the impact of the expected growth in the mining sector? Is there an ideal model for a country that places the exploitation of its mining resources at the center of its economic development? Should we fear the end of resources, so often predicted? And what of the Dutch disease, that has plagued so many natural-resource based countries? 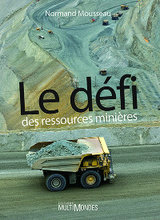 Le défi des ressources minières was published in the Fall 2012 by Éditions MultiMondes. It is available in paper or electronic format here: Éditions MultiMondes. Le défi des ressources minières was one of the final contenders for the 2013 Roberval Award for popularization of science. This prize has been awarded for more than 25 year to recognize the excellence of works aiming at the popularization and communication of science in four categories: public books, academic books, TV documentaries and multimedia productions.